Two years ago, I chose the word REST for my Word of the Year. And it changed my life. I’d tried to jump on the whole “Word of the Year” bandwagon before, but it just never stuck. I would begin the year with these big ambitions and then I’d fizzle out. OR, I wouldn’t really define what that word meant and how it was going to shape my goals and my focus for the year. So it was just a good idea that never went anywhere. I thought maybe I was just not cut out for the whole Word of the Year thing. I thought maybe it didn’t work for my personality or something. That was, until I declared 2016 my Year of Rest. And well, the rest is history. I’m not the same person I was when I started 2016. I’m so much calmer. So much less stressed. So much healthier. So much happier. So much more content. And get this, I’m so much more productive! Because I’ve learned to invest my life in a few things and do those things really well. Instead of chasing a hundred things and just feeling constantly overwhelmed and exhausted. 1. I drew a line in the sand. Instead of thinking that I just needed to get more organized or sleep less or find a way to use my time more wisely, I realized that I needed to draw a line in the sand and make some major changes in my life because I didn’t love my life at all and didn’t want to live life so exhausted and overwhelmed and lacking joy… just trying to make it through. 2. I defined what it would mean. In addition to drawing a line in the sand, I sat down and defined what it would mean to claim Rest as my word for the year. It meant that I would say no to pretty much everything and everyone except the absolute necessity until I found some breathing room in my life. I wanted to actually discover what it would feel like to not live life at breakneck speed, to not constantly be going-going-going, and to not be so overwhelmed by my to do list. 3. I declared my intentions publicly. I got brave and posted publicly that I was committing to have a Year of Rest in 2016. Putting it out there for all the world really gave me the courage and accountability to follow through with me. At the time, I didn’t even realize that my worth was coming from what I did or that productivity had become a sort of “drug” for me. When I committed to a Year of Rest, it gave me the space I needed to untether myself from being chained to a worth based on productivity, to pry my hands off of my tight grip of trying to control so many things in my life, and to step way back from my usual highly-driven, task-oriented focus. And it was there, that a whole new world opened up for me! It was colorful and full of life and joy and breathing room. And I’ve never gone back. Inspired by my 2016 Year of Rest success, I chose the word Yes for 2017. This wasn’t about saying Yes to adding more to my plate, it was about saying “Yes” to more fun and spontaneity and the few things that really matter most and are my priorities in this season of life. As I’ve been contemplating what my word for 2018 would be, it just sort of came to me at the beginning of November. But I let it simmer and marinate for a few weeks before I even mentioned it to Jesse. Because I wanted to make sure it was the right word. I still felt a peace about it after a few weeks, so I told Jesse. He loved it. So I got brave and told and few close friends. They loved it, too. So without further ado, let me introduce you to my Word of the Year for 2018… SLOW. 2018 is my Year of Slow. Anyone who knows me well knows that this word isn’t a word that you’d think of to describe me. I’m someone who is fast — my brain thinks quickly, I make decisions quickly, I respond quickly, I’m a fast reader, a fast eater, a fast walker. As an INTJ, Enneagram 8, my brain doesn’t slow down much. 🙂 I don’t like to sit still, I get bored very easily, and my definition of a “quiet day” is very different than what most people would consider a “quiet day”. So, S-L-O-W is not my usual pace. Let me be clear: I’m not trying to change my personality this year, but I want to challenge myself to slow down in certain key areas. Because I think this would be healthy and good and, quite possibly, life-changing, for me. 1. I’m going to focus on being slower to speak and slower to react. You guys, here’s the blatant truth: I can steam roll over people if I think that my idea is better than theirs (which I usually do) or if I think that my way is the right way (which I pretty much always do!) or if I feel like they are just wasting my time by talking about something when I’ve already made up my mind (which is a LOT of the time!). My personality is such that I am able to assess situations really quickly and know what path I want to take. I’m typically a very quick decision-maker. And once I know the path I want to take, I don’t stand around worrying that I might be making the wrong decision or waiting and hyper-analyzing and researching to make sure I feel like the decision is right. I pretty much make up my mind quickly and then I JUMP. I get impatient easily and I have a habit of cutting people off or shutting people down — without even realizing it. And it’s not good. So one of my aims in 2018 is to s-l-o-w down when it comes to conversations with others. I want to really take time to listen if someone disagrees, to wait to move forward until I’m on the same page with Jesse, and to not cut people off or get impatient with them in conversation (I do this especially when it comes to my kids, Jesse, and a few people on my team). 2. I am going to have one SLOW day each week. Beginning in January, I’m taking Wednesday off from work every week to have an intentional SLOW day — an unplugged, offline day where I’ll move at a slower pace. That’s the day I have Discipleship Group in the morning and I’m planning to go on a date with Jesse after Discipleship Group. It will be my day to invest in my local community, hang out with Jesse, read, and enjoy a quieter and slower pace. I’ve planned our routine and my weekly commitments accordingly and I’m really curious to see if I can actually consistently do this! Will you help keep me accountable?? I know. Did you just fall out of your chair?? Considering that this is the genre I almost always gravitate toward and considering how much I love to read, this is pretty shocking. I came up with the idea a month or so ago and it took me two weeks before I would even say it out loud because it felt so scary. And I knew she was right. Jesse agreed. So here’s the reason I’m not going to read any self-help books in 2018: In the spirit of my Year of Slow, I want to stop reading books that are making me feel like I’m not doing enough — that I need to do more and add more to my plate. There’s nothing wrong with self-help books and I think they can be fantastic — especially when you’re in seasons where you need the encouragement and motivation. But there’s also a point, when you’ve read so many books about time management that you just need to stop reading them and get up and apply what you already know. So there’s that! I can’t wait to see what my Year of Slow holds for me, what I’m going to learn this year, and how this word is going to change my life! Did you choose a word for 2018? If so, I’d love to hear what you chose and why you chose it! Speaking of time management books and productivity, I have been working on a surprise project the past 2 months and finally get to tell you about it! I’m launching a live group coaching in January called 4 Weeks to a More Productive Life where I’ll be walking you through some life-changing principles to help you live a much more productive and fulfilled life. For 2018 it will be “abide.” I’ve been stepping into new territory professionally/ministry-wise and it’s been terrifying and yet amazing at the same time since I can see how God has been preparing me for this for so long. 2018 brings even more “new” so I know abiding in Him will be key to staying at peace and thriving in the midst of all the changes and new challenges! I love that! Thank you so much for sharing! I’m cheering for you in 2018! Amy, Intoo struggle to “click” with a word, but I think I could do a phrase. It’s one that stares at me from a little plaque on my kitchen windowsill, but one I haven’t done well in applying. “Worry less, pray more.” Thanks for encouraging and inspiring me without even realizing it! Thank you for sharing! That’s very cool. “Worry less, pray more” is a great slogan to live by! I’ve found this to be true, during a “boring” time when things have slowed or been delayed, or especially in listening to someone else speak. I’ll have to ponder that quote! My word for 2018 is “fearless”. For too long, I’ve let fear hold me back and weigh me down with anxiety. I’m working on letting go and surrendering everything to God. I actually have a stack of Christian living (self-help) books I’d like to dive into next year. Some include ones you’ve recommended this past year, so thanks! Woohoo!! I LOVE your word! I love that, Carol! May you walk in a whole new freedom as you walk forward fearlessly in Him! Ooh, that’s a great one; I need that one as well! These words are a challenge and a balm to my soul. Lately I’ve noticed how impatient and irritated I’ve been, almost instantaneously. It’s become a way of life to the point that I’m seeing the same habits in my young children (the youngest not quite 2 yet!). How sad, that the reactions and responses of my baby girl, have caused me to realize how I must look and act towards them? God is gracious and merciful to show me my sin through the mirror of my children. But I can’t keep using that as a crutch. So my word for the year is “change”. Intentional, purposeful God-honoring change. Slow change, for sure. Thank you for the the word idea. I’m borrowing yours and adding it to mine.? “Intentional, purposeful God-honoring change.” I love that! Oh my gosh I could have wrote this. I am the same way. I need to implement this word for 2018 as well! I can completely relate. I keep telling my daughter to stop speaking to me in a certain tone; I know she has heard it from me and that’s where it’s coming from. I MUST do better, if not for me, then for my children and their relationships with others. I chose the word, wellness for 2018. I am going to work on physical, mental, and spiritual wellness. Hmmm, you’re making me think a lot about that word too. I am very similar to you (ENTJ!) and I have a challenge sitting still. Thank you for giving me a lot to think about! You are SO welcome! I’m grateful that it made you think! Love the word slow! I’ve been thinking a lot about my word, and I think I’ve decided on present, but I’m still making up my mind for sure. I totally would never have placed you as an Enneagram 8, but after you described how you react to certain situations, it makes more sense! My husband is an 8, and he can have a tendency to just move right on past other people if they get in his way, and I’ve never seen those tendencies toward you online! I’ve also heard that Enneagram 8 women are not super common, so it’s just cool to see that’s your number! I always look forward to your posts at the end of the year, I love reading your book lists and goals! Thanks so much for always sharing your word of the year. It has really encouraged me to do the same for the past couple of years and I’ve benefited greatly from this practice! My word for 2018 is “nourish”. I want to spend my time, money, and energy mostly on things that will nourish me. I realize I need to nourish my body, my skin & nails, my relationships, my spiritual life, etc. I’ve taken some time to figure out what this means to me personally and I’m really looking forward to seeing how it all plays out this year! I love your word! What a great choice! I usually try to pick a theme for the year…and then never live by it. I’ve been contemplating what I’d like 2018 to look like. It’s tough because my husband lost his job almost three months ago, so my part-time gig as a preschool teaching assistant has, by necessity, become much more time-consuming because I sub as often as I can to make sure our savings can stay untouched until absolutely necessary. So, for 2018, my theme will be PEACE. And not just any peace but that which only comes from complete surrender to God and His plan. I’m still working on how this will play out. My type A, driven nature is going to struggle, but I know PEACE is what I, my family, and our lives need. I also know we will all blossom and flourish with it. And I know my heart will be so much more Christ-filled and content! Really getting my blog off the ground and getting my novel published (or self-publish it!) are big goals, so embracing peace will bring clarity to the “how” of all that, I’m certain? That sounds like a fantastic word for you for this next year! My word for 2017 was Shalom-the peace in the chaos. My year was chaos. My husband ended up being hospitilized for his severe depression and I became Chair of Council of our church all at the same time. This year has been a rollercoaster and I don”t like rollercoasters. My word (s) for 2018 are Be Still. I am a go go go person and I try to manage it all. Unfortunately things fall apart time and time again. I need to be still and remember God has it so I don’t have to. I am hoping that this is the year I take a step back and learn to let go of what I don’t need and embrace a quieter prayerful posture. Yes! Yes! Yes! I’m cheering for you as you seek to Be Still! After much prayer and thought my word for 2018 is HOME! My word for 2017 was Awesome…and it was! My husband and I are trying to downsize (last kiddo graduating in 2019) our belongings and ultimately our homesize. My body needs some serious Reducing. I, too, constantly read or watch self-help/inspirational books, videos and courses. I love them but the past several months it has scattered my thinking instead of focussing it. I’m still waiting and pondering my word. Nothing feels right yet. I’ve just realized that 2 of my sons have dealt with some pretty heavy issues alone. I’m so disappointed in myself that they didn’t feel they could come to me for help; that they felt they had to handle it alone. It’s very humbling to realize that the doors of communication were shut. I’m hopeful that it’s not too late to change things for us all. It’s definitely not too late. Lean in, love them, pray for them, get into their world, be interested in what they are interested in, learn what their love language is and focus on loving them in a way that makes them feel loved. There is hope! And it’s so beautiful how much you love your kids. What a gift! Crystal these are very powerful and true words that any of us with a struggling child should live by. Slow. I didn’t expect that. I can certainly understand that. The last 2 years my Word has been joy. The year before that it was hope, but this year my Word is going to be Serve. My dad passed away 4 years ago and his death kicked me hard. I’ve been an hermit ever since. I’m naturally an Introvert and serving is difficult for me. I’m cheering for you and your year of serving! My 2018 year is TRANSFORM…going to work this week on breaking it down into catergories (health, finance, relationships for example). My theme for 2018 is centering around reduction. Reducing how much I work, reducing how much sugar and processed foods I eat, reducing my stress, etc. However, I would love to find a more powerful, uplifting word that is in line with this. Love SLOW! Might have to use that next year. What a great choice of a word! I have been thinking a lot about what I want 2018 to look and be like and the first and only word that keeps coming to me is Breathe. I often find myself with the feeling I can’t breathe. I find that some situations make me feel that way also. I am a person who will give 100% of myself to any given situation only to be left feel without air. Two of my four children are dealing with major stresses in their life they are 10 and 14 sometimes those stresses are very heavy for me and I once again feel that way. So for me Breath means allowing myself to relax I need to relax and focus on the things that bring me true Happiness. I need to also make myself a priority I do everything for everyone else then there is no oxygen (energy) left for myself. I need to surround myself with people, things, situations, and experiences that put oxygen (life) into me rather than take it from me, I want to feel alive. This year I want to BREATH all of life’s fresh air! I had “breathe” for my word a couple of years ago. It was wonderful to find so many references to breathing/breath in the Bible. I notice that when o remind myself to breathe, I slow down and am better focused. I love your conclusion from sharing this!! Thank you for taking the time to comment! Slow… This is definitely something that I need to work on. One day of “slow” is a great idea and one that I would like to implement. I started choosing a focus word two years ago and it has totally changed how I look at the New Year. Two years ago my word was “commit,” something that I admit is still a struggle, but thanks to a new perspective is an idea that I now take seriously. Last year was “seek.” Seek God first, then seek to learn more. This year my focus is “reflection.” Reflecting on how far I have come, where I am, and where this path will lead me. I pray that your year full of blessings! What great words! Thank you for sharing! I took a sabbatical from reading self-help books for about three months this year after a brave friend told me that I was “no better reading for reading them!” You know what? I think she was right! I was much happier not reading self-help books and spent a lot more time in gratitude & contentment. I have gravitated back to self help books & I think I need to go on another sabbatical soon Good for you taking a day off a week. Love your intentional living…it is inspiring! This encouraged me so much to hear! Thank you for sharing! I laughed out loud when I read your word because we have very similar personalities and I picked a similar word: Still. I need to take time to be still and present with God, myself, my husband and my kids. I want to make sure I’m taking the time to be still to know what is most important. Can’t wait to follow your journey! The idea of self-help books is one I’m going to think on. I don’t know if I’m that brave, but I might say I can only read one for every 4 others I read. We’ll see if I last the full year or not without reading self-help books! 😉 I’m hopeful I can actually do it! My word for 2018 is Joy. I’m going to smile more, take opportunities to play with my children rather than be too busy, have fun, do things happily rather than begrudgingly, laugh more, step out of my comfort zone, worry less and just enJOY life and all I’m blessed with. 2017 was rest and I learnt to prioritise what was important, drop my own high expectations of what I needed to achieve and slow down and relax. Slow sounds awesome! In this crazy fast paced world we are living in, we all need to slow down and relearn to enjoy life, to think before we reply, to add quiet times to our days and allow margins to breathe. I’m so pumped for your next year, as well! Aw! You are so sweet! I love that you are anticipating the new year! I can’t wait to hear how it turns out for you! Slow is my word for this coming year too! That’s crazy! I guess we’re probably at the same place in our lives, huh? My husband comes home from his year long deployment in 2018 and I want to take everything slow…soak it all in! And YAY for your husband coming home in 2018!!! That’s a great word! Mine will be Commit. I’ve chosen the grand scheme ideals I will be committing to for the year and each month I have something related to or supporting those grand schemes that I am committing to so I can further reach my goals. I’m also incorporating it in my Miracle Morning affirmations and visualizations, so it will continue to be front and center in my life. I love your word! Thanks so much for sharing! *Physical – I am ready to get into physical shape and have a strong heart to live a long life. *Spiritual – I am ready to be a woman after God’s own heart, to keep my heart pure. *Emotional – I ready to fall in love again. Love this! I’m ready to fall in love again too, after a heartbreak in 2017. 2017 my word was “Nourish” and I think I did a pretty good job of adding more greens, restorative Yoga, prayer and meditation, while trying to nourish my family as well. Of course I could do more, but on the whole I made some good progress. 2018’s word is “Mindfulness”. I want to really be mindful about what I do, how I spend my time, and how I treat myself and others. My word for 2018 is Treasure. As in to hold dear, cherish, value greatly. I plan to treasure myself by eating well, exercising, and starting the Miracle Morning. I will treasure my family by listening more, spending quality time with them, having more homecooked family dinners and unplugging more. I will treasure my home by keeping it clean, organized, and welcoming to family and guests. Aw! I’m so grateful that it has encouraged you! I love it! I hope this will be a wonderful year for you. I’ve chosen the word “simplicity”. I want to simplify and scale back on my commitments and our household possessions. What an amazing post. It is very timely as I just read Jon Gordon’s book about the very same topic. I’ve been pondering and praying and seeking the right word. I think it came to me today. My wife and I have 4 kids and we’ve just been in a very busy season. She miscarried early in 2017 and there has been a lot of pain and questions surrounding that. My wife’s grandma passed away just two weeks ago. For the past two weeks we’ve talked alot about finding joy. The topic keeps popping up into conversations and Joy is going to be my word for 2018. Now I’m going to define what that looks like. Thanks for the inspiration. Joy is such a great word! I’m focusing on the word “content” this year! I know that as I let go of foolishly set expectations, I will find greater contentment in all aspects of life. I have greater peace and joy, and will be much easier to live with (for my loved ones and myself)! Contentment is such a great word! I love your plan to read story-driven books, inspirational books and biographies! Stories are so powerful in their “stickiness”. I think of how Jesus taught in parables. I always enter a story emotionally, which makes it stick! You continually encourage and motivate me! Thank you for being you and keeping it real! Love it! And I hope you have a great night’s rest! Honestly, I don’t understand having a word for the year. I have no idea what it is for or how to come up with one. 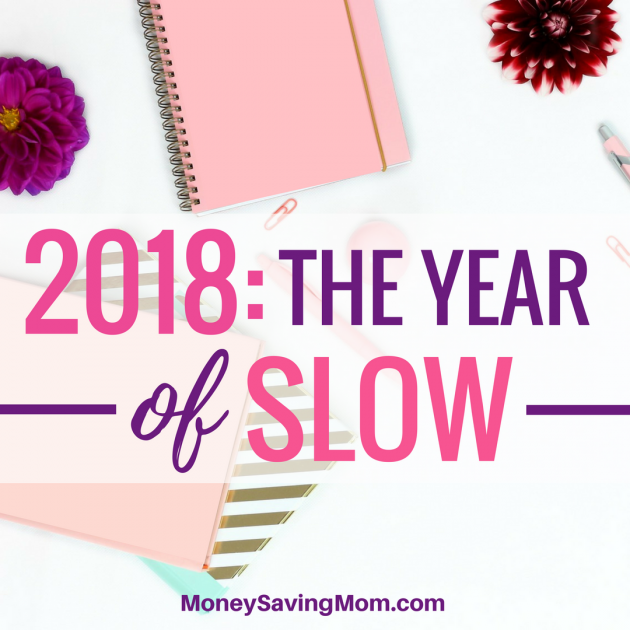 I’m excited for your year of slow though. Right on about the self-help books. Sometimes, you just need the ability to do your own thing the way that works best for you. It’s definitely not for everyone, but it’s been such an impactful thing for me the past two years! My word for 2018 is LISTEN. Just like you mentioned, Crystal, I tend to charge right through situations and jump into action. Similar to your desire to slow down, I want to listen more. Listen to God, listen to my friends and co-workers instead of jumping in and making the conversation all about me. That’s a great goal! And the no self-help books for a whole year IS shocking!! Self-help book are my favorite. I don’t think I could go a whole year w/o reading one. I could maaaaaybe do 3-6 months. lol That’s what I go to when I come across new situations in my life and with 5 kids…there’s always something. And I just desperately need the encouragement I get from those types of books. 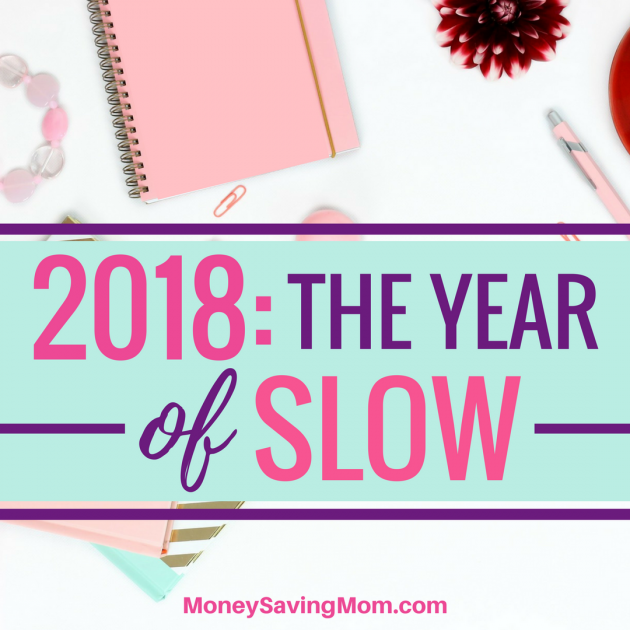 I’m just now sitting down tonight to think about what I want for the upcoming year and I’m definitely leaning toward something like “slow.” I’m thinking maybe, “content” (as in satisfied). I struggle so much with feeling like things just aren’t the way I want them. I’ve found that self-help books can be so fantastic… in certain seasons. But they can also contribute to making me feel like I’m not doing enough/need to be doing more/am not measuring up. So I’m curious to see what happens when I am not reading them for an extended period. I might not like it at all… but I think it might be freeing and insightful. We’ll see! Romans 12:2. My word for 2018 is Transform. Physically and spiritually. Physically, I need to lose a significant amount of weight and just get healthier. Spiritually, I need to be intentional about putting God first and spending time with him and significantly less time on my phone, Facebook, etc. I’m excited about this new year and what God is going to do in my life. I pray that by this time next year, I will not be the same person I am right now. My word of the year is going to be tradition. I feel our family life could benefit from a focus on creating meaningful traditions for the days, weeks, months and special occasions – things that will help create memories and give us things to look forward to. I’ve made a list of things to try and am super excited about it! Thanks so much for sharing! What a great word! Crystal, I was guessing you would do another year of rest. Slow is very inspiring to me. One of my clients has Wednesdays off, and I have considered doing the same. We’ll see. Next week I will be planning out my weekly schedule for 2018. I have not chosen my word yet. 2016 and 2017 were both years of change and growth for our family. In 2018, I want to focus on my relationships with God and my husband. I’m really curious to see how it goes to take Wednesdays off! My word for 2018 is HOPE. So many things in my life have been so very difficult for the past dozen or so years…getting increasingly so over the past two. My marriage, two unsaved adult children, financially struggling on one income while I homeschool our youngest three children. As I basically spiritually parent alone, I often feel like my motto is “faint, yet pursuing” from the story of Gideon. So this year I just want to bask in the hope I have in Christ. Looking into Jesus… knowing that He is my sure hope…even if things this side of heaven never improve. My 2016 word was live. I wanted to live life as full as my heart could take and take the time to really get to know my kids. 2017 word was unstoppable, which may seem odd but I have been unhappy with verbal abuse making me feel insignificant from my husband. This time I’m not going back. I am spreading my wings and finding the true me (instead of the one I was supposed to be). This year I have had trouble deciding between fly and heal. Im standing up straighter and confident in my words. Decisions are coming easier and accepting help is something I just have to do right now. I am moving forward and that is what is important. My word is ‘surrender’. I’m tired of constantly trying to control everything around me which only leads to disappointment. Not my will but His be done in 2018. Amen!?? ✝️?? Obedience. I am a terrible control freak and need to learn to obey God’s plan for me. I realized that choosing which things I am comfortable with in God’s plan for me is not true obedience….its just more of doing what I want, when I want, where I want. I think this is going to be terribly hard for me, but will make me a better person. So this includes saying yes to as much volunteering possibilities as possible, attending all holy days of obligation(I find ways to avoid them…), and being a better wife/mother by doing things that may not be easy for me. Wish me luck! I about fell out when I realized our word. It is mine too! Came to me 2 days ago in my God-time with journaling. For reals! For many of the same reasons you listed and a few others. Slow. Email me if you’d like to dialogue more. What a great word! Not sure what mine is yet. While 2017 wasn’t a bad year, it always felt like I was playing catch up….want to be more ahead this year. I find I’m a happier person when I’m planned in advance. Everyone in my family benefits! I love how there were so many comments to this post! I love reading them and I’m looking forward to more of your personal posts again! I didn’t have a word for 2017. But I guess my word for 2018 is Heal. I just lost my husband of 31 years last month. It’s going to be a very long hard road. I’ll say a prayer for peace and healing for you. Prayers for you. I am so sorry for your loss. God is strength. Lean on Him. Emily, I’m so terribly sorry about the loss of your dear husband. Prayers for peace and healing for you, and for the repose of his soul. So sorry, Emily. Psalm 46:5 is one of my favorite verses. Hoping it encourages you today. This is my first year doing a word of the year, and I picked a big word for me, Discipline. I realized my lack of discipline really added to my stress and negative feeling of myself. So I’m going too focus on a few things that I haven’t quite ironed out. This is a great word, and I’m stealing it ☺️ I have terrible self discipline, and I can’t seem to stick to anything. Thanks for the inspiration! Glad I could inspire someone. I’m not exactly sure how I’m going to break it all down just yet, but this word may take me a couple of years lol. You and me both! I wish you luck! I have never had a word for the year, either, and I chose that same word. I think I used to live a lot more disciplined life than I do now, but I have let life’s circumstances get me down and have allowed myself to continue to live in an undisciplined state even though those circumstances have changed again for the better. Mine will be “Health” I always say “this year I will lose x amount of weight” and never do – so this coming year I am going to concentrate on being healthy, living healthily and any weight loss is a bonus! These are also my intentions but I hadn’t yet come up with a “word” for the year. I hope I can share your word! My word is IGNITE. I want to have more energy, ignite my 2 businesses. Ignite the romance with my husband! I want to be more active and productive. Oh! I love your word choice! I needed to read this today (and see it in your instagram stories too!). I’m the same with self-help, I read so much but don’t stop to digest and put in practice. I have a lot of knowledge but need to apply it. Thank you for this! My word for 2018 is Intentional. I want to do all things with purpose and with the right intention. 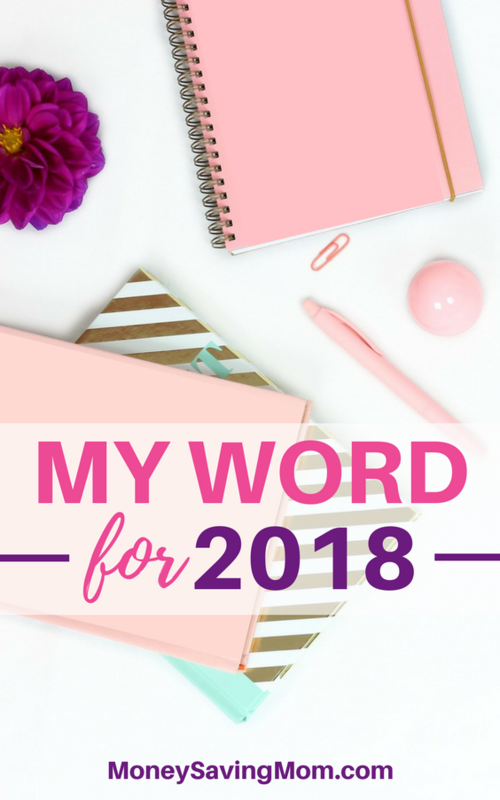 This will be my first year trying a word of the year and I have decided that 2018 will be a year of FOCUS. I want to focus on myself and live a healthier lifestyle and I want to focus on getting our finances in order. I feel it is going to be a good year. Yes! I hope it’s a GREAT year! My word is B.U.I.L.D. Build Boldly, build Unity, build Integrity, build Love, build Diligently. A focus for every letter of the word. It came to me when I was doodling one day. What a fun idea to a focus for every letter of the word! I am still thinking through my word of the year. Wow! Thank you for sharing all the details how you make your word of the year a success. I want to focus on building my relationship with Jesus. I get distracted by all the good books.good blogs.good podcasts. They distract me from the most important relationship I need to be building. They share lots of great thoughts and ideas like you said your self-help books do. Then I am off doing those things they suggest. Very fleeting. I want to stay focused and finish. I think I am going to start the New Year by doing 1&2 Kings study through First 5 App (Proverbs 31 Ministry). And I am going to do just that 1&2 Kings study and read the book Finish to encourage me to FINISH. So maybe relationship.focus.finish as my word of the year. What’s the opposite word of distracted? FOCUS? Thank you! Writing out my thoughts have helped. I love your goals and your thoughts here! Thank you for sharing! as often as it needs to be done. No excuses, just results. Tough one to be sure. Moving everyday on purpose and habit, not feelings. Like brushing your teeth. Doing the laundry or driving to work. You don’t feel happy or motivated to do those things. They are just things that have to get done. But you made a decision somewhere in your mind to make them a habit that you would do regardless of what you feel or how the day is going. Sounds good in writing, now I have to walk out the truth of it. I’m right there with you! Slow needs to be my word of the year for 2018 as well. I have a very similar personality. I’m an INFJ and I can definitely relate to everything you said in this post. I need to slow down when speaking and reacting to others. I used to have more patience with people and would hear them out and actually listen, but I’ve found that I’ve slipped into the bad habit of cutting them off and/or being impatient with them, just like you mentioned. Wow! Like looking in a mirror; INFJ. I am also going to adopt “SLOW” as my mantra for the year. I add my word to my phone as a daily reminder which helps me stay focused. Congratulations! SLOW is the perfect word. I had been taking things slower and simpler this past year and I loved it! I also congratulate you on not reading self help books. I don’t read them for the very reason you state. May you have a wonderful blessed beautiful New Year and all of 2018! I hope you have any amazing year, too! Mine is “Joy”. This last year felt very Meh, and I need to spend more time in gratitude and relishing my life. My word for 2018 is Focus. I want to focus on what really matters long-term rather than allowing my short-term desires to overshadow what is truly important to me. On a practical level, I’m going to schedule a 3-hour block each morning to focus on studying (I’m in my last year of university! ), and during study time I’m not going to do anything else. I’m going to choose to work on setting up my blog instead of watching TV. I’m going to choose to read books I’m excited about instead of mindlessly scrolling through Pinterest. I’m going to intentionally guide my attention to things that will matter in the long run. I’m really excited to see how my life will (hopefully) change this year now that I’m choosing to be intentional about where I put my attention! I’ve found that time blocks where I just focus on one thing (especially when it comes to work projects!) work amazingly well — and I get SO MUCH more done! I hope it works really well for you, as well! CONSISTENCY. I’ve never done a word of the year before, but as I was reflecting on this, the word “consistency” came to mind. This past year, my times of biggest stress and frustration were all related to me not doing consistently some routine things that need to be done. As a result, I’d have to rush around at the last minute and get them done under stress and pressure. If I had just been faithful in doing the small things all along the way, I wouldn’t have been in that situation. I’m someone who has a lot of ideas and I love starting new things, but I get kind of bored at the daily work required to maintain things. However, this lack of consistency in some areas robs my family of peace! 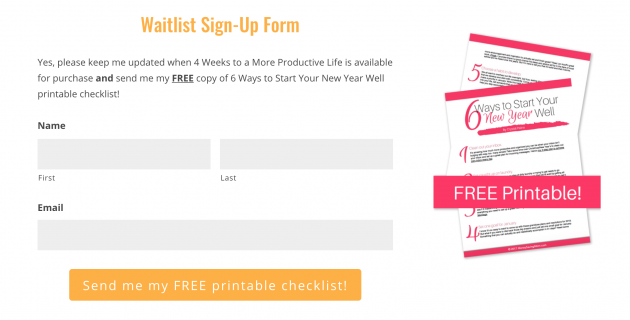 I don’t need to start a bunch of new things this year, or dramatically change what I’m doing. I just need to quietly and consistently follow through on the small things I know I need to do which in the long run make a big difference to me and to my family! My 2018 word of the year is Brave. Those five seconds of brave needed to hit submit on writing projects. Being brave and persevering when I’d rather jump ship. Being brave and running my own race. Looking forward to following along on your year of slow, Crystal. My word will have to be Peace. I lost my husband of 47 years to cancer in October 2017. I cannot/will not live this life in constant grief. He would not want that for me so I need to find a way to reconcile this horrible loss and then bring myself into a state of being at peace with it. This will be my first year of selecting a word to be honest. I am struggling with the word here, I was thinking of focus, focus on my goals and my marriage, kids, work, house, health and me but those are things I always try and do and those are things that I somehow get lost in? I guess I am not that great at focussing on any one thing especially me? So I am back to another word I am considering and that is Content, I don’t know if I am or have ever been content to be perfectly candid. Always looking for more, striving for more, craving more. More time, more rest, more money, more space, more and more and I feel like I never am enough or have enough. I often don’t take time to see what is there because I am always looking for something more or better and miss so much. I am an avid self help junkie and strive for perfection but often get discouraged by the lack of support around me. If your family is not on board around you it often derails you and makes you feel worse. You can not exactly clean and organize your home if others don’t care and or get on board. You can’t do a couples book devotion if your husband will not read it? You can’t change others around you. Perhaps I should do the word, ME. The year of me, it seems somewhere along the way I lost me. Always pleasing others and putting myself last. Maybe this will be my year? Open to ideas and thoughts here everyone. How does one focus on herself and still be a great wife and mom? Is that possible? I always forget to be kind. Not to others I’m pretty good at that but kind to myself. Kindness to yourself; could mean saying no, investing in self care, investing in the relationships around you. Kindness to others; praising the good in others around you and focusing on their positives attributes, getting involved in the community more or less depending. I have picked a word most years since 2008. 2016 was “Be” We were coming out of a hard season and I just wanted to be..
to be present, to be engaged, to be still. 2017 was “Content” Again it was all about the few years before that were life changing and chaotic. 2018.. my word I chose, even before I read your blog post was, “Pause”. I was telling my husband. Pause for the important moments, to pause the craziness of having teenagers and the years going by so fast, pause to make time for my family. Pause before I speak. Pause before I act. Pause before I make commitments. I love the word Pause! What a great choice! 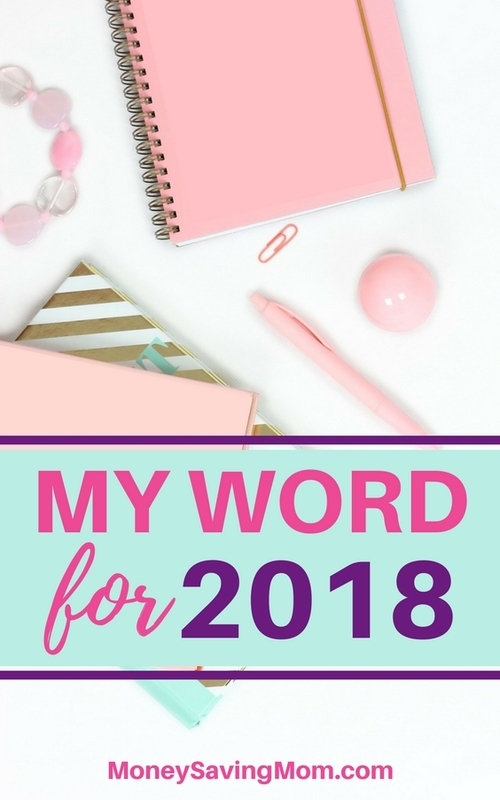 This is the first year I have chosen a “Word of the Year” and actually chose it one morning after my morning quiet time with the Lord in early December. My word is ABIDE. “I am the true vine and my father is the vinedresser. Every branch in me that does not bear fruit, He takes away; and every branch that bears fruit He prunes it, that it may bear more fruit. You are already clean because of the word which I have spoken to you. Abide in Me, and I in you. As the branch cannot bear fruit of itself unless it abides in the vine, so neither can you unless you abide in Me. I am the vine and you are the branches; he who abides in Me and I in him, he bears much fruit, for apart from Me you can do nothing. After pouring out my heart to the Lord that I no longer wanted to to strive in my own feeble strength to tackle “hard life issues and craved for change” only to end up exhausted, overwhelmed and joyless but instead to be joyfully fruitful and transformed…..He gave me the words “Abide in Me”. That settled it for me! I realized that I had responded to His call to “Come to Me all who are weary and heavy ladened….and I will give you rest.” but not responded to His loving command “Abide in Me” : surrendering my dreams, goals, will to Him AND slowing down to spend intentional time in His presence through His Word and in prayer, meditating on the specific truths He was speaking to me so that HIS will would be done in my life. 2018 is going to be an amazing year because by His grace, I will trust and obey and intentionally abide in Christ who always does exceedingly and abundantly above and beyond what we hope for or can imagine! “We become what we behold. ” To be more like Christ in my all my realtionships and be transformed from the inside- out ( my sanctification), I must ABIDE in Christ. Wow, Crystal, you have really inspired me! I followed your blog for many years when you first started and it was always so helpful! To be honest, life has become so full that I haven’t kept up, but I’m glad I happened upon this. I’ve never been good at word of the year, but I want to use your idea and focus on the word REST. I have 10 kids, and also homeschool my doctor’s son. My hubby and I own our own business and run the youth ministry and young adult ministry in our church. I LOVE being able to love and care for so many kids. However, my health and my house have taken their toll and I can’t keep up. I honestly don’t know even where to begin. I’m learning to say no, a little, believe it or not, but could use help on how to even rest. Sounds silly, but I don’t think I know how. Maybe I should read more about how you did this in 2016. Thanks! My word for 2018 was slow in coming but it is finally here. Renew. This year was marked by burnout and frustration in many areas so a year of renewal is what I need. Thank you for changing your blog back to how it used to be! I loved it! Mine is solutions. I tend to focus on the problems.. and go round and round in my mind just thinking about them rather unproductively. Now when I realize I’ve been hashing something over and over, I’ll stop and say out loud ok I know the problem, so now what are my options? what are the solutions? Then I can make a decision to fix (as best possible) whatever is going on. No more merry go rounds of self berating, or worry, or helplessness. Solutions! Crystal! I love this post and I’m so glad to see you’ll be posting more like this. My word for 2017 was Daughter. God showed me how to receive from Him not just do for Him….and that whether I do or don’t do, He loves me the same. This message positively impacted my tightly wound self so much that it became the core message of my upcoming book, “Made Like Martha: Good News for the Woman Who’s Gets Things Done.” 😉 This coming year my word is “beyond”…feeling like it’s going to be a year to enjoy God and those around me more and to receive and extend His love in greater capacity. Enjoy your year of slow! I’m inspired by how you set goals around your word, to make sure it stays a priority. My word for 2018 is FINISH. I will complete my MS degree in May. I often start projects and don’t finish. I think by focusing on the ‘Finish’, it will help me be intentional with what choose to spend time on. My word for 2018 is Unafraid. I’m still unwrapping the layers of what that will mean for me. But I tend to be introverted and afraid to “do it scared”. I want to change that in 2018. What a great word! I’m cheering for you! Oh my goodness. Your #1 focus for slow is so me. But using the word slow with it is a different way for me to look at changing. The best thing I’ve found helpful so far is praying specifically before I go into a social situation; not to take over, listen more. But I love thinking about slowing down my thoughts and conversation, also … always with prayer of course. And where do we exchange book recommendations with you? A book I really enjoyed this year that would be quite opposite of self-help is Sergeant Rex. Thank you so much for the book recommendation! I really want to do his word of the year but I don’t know how to go about it – what to do etc. I know that I need to do something and I’m between slow, rest, focus. Any help is appreciated.